Building on Jackson’s extensive interest in and knowledge of the First World War, this exciting new film will use modern-day techniques such as colourisation to portray the Great War as never before, and promises to provide a 21st-century public with a unique new perspective on the 20th century’s most shocking conflict. What is going on here? Colourisation of black-and-white film is not a new thing, of course. It was introduced in 1980s by studios with the hope of converting old film into more marketable commodities for generations who could only accept colour. The results were frequently garish, and the reactions from filmmakers and commentators was invariably hostile, objecting to the abuse of art and the ignorance of how the films has been originally composed (lighting, design, costume) for showing in black-and-white. There was nervousness over what would happen if ever someone decided to colourise Casablanca or other such classics. In the end, colourisation became a niche activity, derided by anyone who knew their film history, but still surviving on some bargain bin DVD releases and afternoon TV slots. 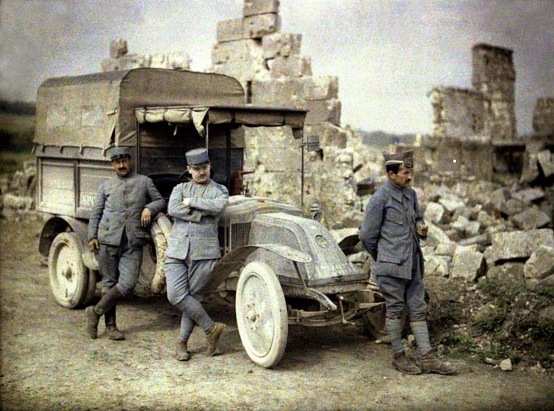 In 2003 there was a television series, World War I in Colour. 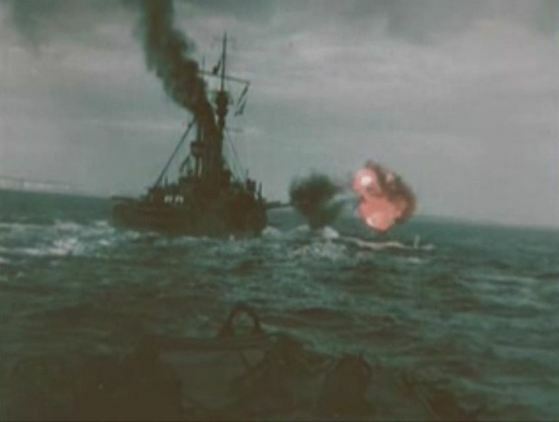 Over six episodes it presented an entirely colourised film of the war, accompanying a standard narrative related by Kenneth Branagh. Aside from its garishness, there were criticisms from those who knew their military history and their film history. To begin with, in the First World War era, film was made on orthochromatic stock. Such stock was sensitive to green and blue, but lacked red sensitivity. Only with panchromatic stock, introduced in the 1920s (after earlier experiments) was sensitivity to all colours established. So the idea that by colourising a First World War film you were using the black-and-white record as a key to a hidden colour record was false. The authentic colour could not be digitally deduced from the monochrome. So it was that there were falsities of uniform colours, insignia, skin tones, skies and landscapes. It was a fantasy, the equivalent of a period colour postcard, or the artificially coloured films of that time, where colours were painted mechanically onto the film stock. Very pretty sometimes, but quite untrue. But the rest the First World War film archive, 99.9999% of it, is in black-and-white. That’s the historical reality. That is our inheritance. 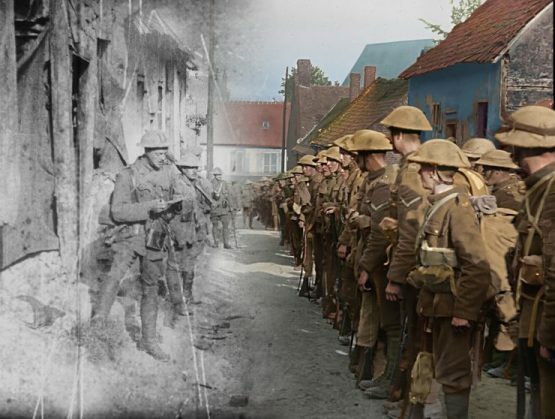 There is an argument for the colourisation of footage from the First World War. One can say that the original film is, of course, not reality, but a reflection of reality. Overlaying it with colour is only a further treatment of that reflection of reality, a way of looking at the past rather than the pretence of being the past itself. One could argue that the original filmmakers would have chosen colour if they could (undoubtedly so), so that colourisation is only a belated response to their wishes. One could argue that Jackson’s film is a work in its own right, with the express purpose of communicating an idea of the immediacy and humanity of the war through means that speak to a young generation who know nothing of black-and-white film. The original films remain in black-and-white, to be consulted separately as the precious artefacts that they are. No damage has been done, and some good has been achieved. If we want to encourage a new generation to understand what the war meant – and of course this is a good thing – we should be inviting them to look at the films as they were made and through that effort to appreciate them for what they are, and what they meant in their time. It’s the effort that creates the understanding. Without that there is no true sympathy, only false sentiment. Film that looks like it was shot last week belongs only to last week. Apparently not only has the Jackson film has been made with the blessing of the Imperial War Museum (home to the UK’s First World War film archive), but the IWM co-commissioned it. This seems hard to believe. To me, it is contrary to everything that film archiving is about. Yes, on some occasions archive film can and should be manipulated for particular ends. It need not always be treated reverently in its original form alone – that way elitism lies. But using it to show what it is not does more damage than good. If we want people to understand the past, we should not be colouring it. Update: The film is called They Shall Not Grow Old. Thanks for this post Luke, I’ve been thinking and worrying about this since I read the press release. The IWM? Really? It smacks of gimmickry and not much else; hopefully I’m wrong. I’d like to know more before casting aspersions, and of course we all need to see the film rather than judge from a still and press release quotes. It could be brilliantly done, and brilliance becomes its own justification. I’ve seen the film now. I have to admit I was greatly disappointed. I had expected, after all the strong reviews and positive comments from some who know their subject, that I would see something that forced me to change my ideas. Instead I saw something characterised by unreality. The colour looks, as it indeed is, as something added on rather than growing out of the source material. It is palpably false. The absence of grain, the loss of resolution with the blown-up close-ups, even the fact that the entire war seems to have been conducted under sunshine and blue skies, all counted towards the unnatural feel, at least as it came across to me. There were some sequences where the colour caused a jolt of surprise; at times it was useful (mostly the bloody scenes). But the monochrome that topped and tailed the film had a good deal more to show, and to tell, despite being shown at too fast a speed (presumably to accentuate the difference). Instead what impressed me was the sound. What we have here is a great oral history production. The sound editing is superb; a monumental effort compiling extracts from all those interviews, with such character, variety and propulsion. Indeed, I would have preferred the whole thing to have had no pictures. They only obscure what is excellent about it. The awkward question for myself is – would I have been convinced had the colour been better? But if so, convinced of what? Thanks, Luke. I myself found the film very moving, but I too am not sure I needed the colour to be affected. It does feel unnatural and therefore ‘false’, but I became so engrossed by the ‘storytelling’ aspects – which are mainly to do with the aural narrative, of course – that I came to forget about that. Since I wasn’t expecting too much (indeed, I suppose I was half expecting to take against it), I was for the most part pleasantly surprised. A special presentation of this unique film commissioned by 14-18 NOW and Imperial War Museums will take place on 16 October 2018 at BFI Southbank, with Peter Jackson in conversation. The 62nd BFI London Film Festival in partnership with American Express® is delighted to announce that Peter Jackson’s First World War film, newly titled They Shall Not Grow Old, will be given its World Premiere as the Documentary Special Presentation at the BFI London Film Festival on 16 October, at BFI Southbank. Trafalgar Releasing and the BFI London Film Festival are also pleased to confirm that the film will be simultaneously screened, in 2D and 3D to cinemas and special venues across the UK. Attended by the director Peter Jackson, the simulcast will include a special post screening Q&A with Jackson, hosted by film critic Mark Kermode. 1.5. When restoring materials, archives will endeavour only to complete what is incomplete and to remove the accretions of time, wear, and misinformation. They will not seek to change or distort the nature of the original materials or the intentions of their creators. 1.6. When providing access to materials by programming, projection, or other means, archives will seek to achieve the closest possible approximation to the original viewing experience, paying particular attention (for example) to the appropriate speed and the correct aspect ratio. 1.7. The nature and rationale of any debatable decision relating to restoration or presentation of archive materials will be recorded and made available to any audience or researcher. Perhaps Mark Kermode will include it in his questions.